Usage: Take 1–6 capsules per day between meals or after a workout, or as directed by your qualified health care consultant. Glutamine is the most abundant amino acid in the human body and is involved in many metabolic processes. Skeletal muscles are the primary sites of glutamine concentration. Glutamine protects muscle tissue and supports immune function during periods of immune and muscular stress. Glutamine supplementation supports protein synthesis as well as the rate of glycogen production (by serving as a carbon donor). Glutamine supports integrity of intestinal mucosal cells and nucleotide synthesis by lymphocytes. 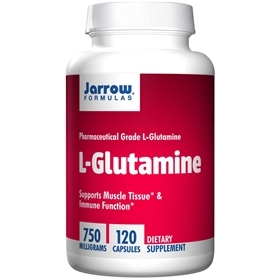 Jarrow FormuUlasAS L l-Glutamine is produced by microbiological fermentation and is USP/FCC grade made in Japan.